Boo! began in 1997 in the backstreets of dirty Brixton, Johannesburg when it's first members, Ampie Omo, Chris Chameleon, and Leon Retief conspired to make music that would go against most of the conventional wisdom of the time. Having considered names like ?Yello Lilo? and ?Die Wit Ding Wat in Die Pad Le,? it was Chris' dream of playing to the sound of a stadium boo-ing the band that eventually won out. Although the name was in part, designed to thwart any chances of feedback on a bad performance, this contingency was never required, as Boo! became not only one of South Africa's favourite bands of all time, but also one of the country's proudest musical exports to both Europe and North America. The band's sound consisted of bass, drums, brass, keyboards and percussion; notably lacking guitar. In spite of this unusual orchestration, Boo! hit the number one position on the 5FM top 40 with ?Stagefright? and a number two position with ?OOAA,? 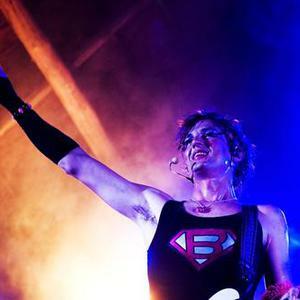 testimony to frontman, bassist, resident drag queen, Chris Chameleon's exceptional songwriting abilities. In September 2004, Ampie Omo and Leon Retief announced their resignation from Boo! and performed their final show with the band on 14 December 2004. Leon Retief continued his career in a drive to create order from the chaos that is the general state of affairs behind the scenes in South African music. Ampie Omo continued his career as a member of ska-outfit Fuzigish and Chris Chameleon surprised his punk pundits and cohorts by becoming one of the best-selling and critically most acclaimed artists in the Afrikaans music landscape, notching up a total of 17 national awards in four years including a South African Music Award (SAMA) and a Medal of Honor from the South African Academy of Science and Arts. 2010 sees Boo! back with a change in wardrobe, drummer Riaan van Rensburg, Ampie Omo and Chris Chameleon back in the saddle, an album recorded in Amsterdam, and the very musically irreverent and emotional antics that created this South African legend.